Samsung had objected to Apple's proposal to show to jurors a Federal Judicial Conference video that shows people using Apple products and highlights Apple products in the context of patentability criteria such as novelty. Samsung argued that the previous version of that video, which was shown to the summer 2012 Apple v. Samsung jury in the same district, should be used because it can serve the same purpose without being prejudicial to Samsung. But late on Sunday, Judge Koh overruled this objection, without citing any reason. This decision marks a surprising departure from Judge Koh's previously consistent efforts to ensure a level playing field for Samsung in Apple's home court. It's even more surprising in light of Judge Koh's recent reference to empirical evidence of national bias by U.S. juries in patent cases against foreign companies. If Judge Koh is (rightly) concerned about such bias, for which there is even statistical evidence (which she cited), I thought it would have been a no-brainer for her to just simply use the same video as at the summer 2012 trial instead of one that is, in some parts, like a propaganda video for Apple's innovative capacity. I think the video overstates Apple's contributions to innovation. On the one hand, there's no doubt that the iPhone and the iPad changed and created entire product categories. On the other hand, in the context of patent law it's key to consider what existed before. Apple's European patent infringement lawsuits against Samsung, Motorola Mobility and (to the extent they were even adjudged) HTC have been a total failure -- mostly non-wins and not a single lasting win -- because the (unbiased) judges over here found with respect to (almost) each and every Apple patent that came to judgment after a challenge that whatever Apple added on top of the prior art, if anything, was not inventive by European engineering-focused standards. The only thing worse than showing this video to jurors that could be done to manipulate jurors would be to bring the "Steve Jobs patents exhibition" to San Jose and give the jury a guided tour through it before the trial starts. It would be wrong to say that Judge Koh generally sides with Apple. In the single most important context to Apple, its pursuit of a permanent injunction, Judge Koh has twice (before and after a partly-successful appeal) agreed with Samsung that Apple failed to establish a causal nexus between the infringements identified (which are now being apppealed) and the alleged irreparable harm. I had actually thought in both cases that Apple was going to win an injunction of some scope -- maybe not over all of the asserted patents, but over some of them. But before the trial in the second Apple v. Samsung case has even started, I'm concerned (because I am, quite frankly, tired of all those Apple-Samsung trials) that whatever Apple may win at this trial will be tainted and might face a really rough ride on appeal, which means that another group of jurors may have to be selected and spend weeks in court because things weren't handled correctly and fairly the first time. "At first sight, this may seem very funny, but I actually understand why Apple would make this request: at a conscious level, it can show to jurors that Samsung actually contributes technology to the U.S. government, and at a subconscious level, it creates the impression of the court being Samsung territory." I now support Samsung for the same reasons for which I supported Apple then. I find Judge Koh's decision very troubling. Your thoughts, please: what license fees should Apple and Samsung agree on to settle their global patent dispute? I'm not going to do the usual preview post listing patents, products etc. before the trial in the second Apple v. Samsung litigation in the Northern District of California kicks off. I won't blog about the trial per se until after both parties' opening arguments. But almost three years after the first lawsuit was filed, it's anything but premature to think and talk about the terms on which they should settle their worldwide dispute with cases pending in at least ten countries. It took Apple less than two years to settle with Nokia (where it ended up the net payer) and less than three years to settle with HTC (where Apple is on the receiving end of the royalties). At least 29 royalty-bearing Android patent license agreements are known, most of which were concluded without the need for any litigation. I have an opinion on what would be fair and reasonable terms based on today's state of the battle. Obviously, whatever seems to be the right choice now could appear less than fair for one party or the other further down the road. It's all a question of leverage. But that need not prevent us from thinking about what would make sense if they wanted to reach an 11th hour settlement now. How much should Samsung pay to Apple per smartphone or tablet? How much should Apple fork over to Samsung per iPhone or iPad for its standard-essential and other patents? Should only one party pay? Should they enter into a zero-zero cross-license (no money changing hands at all), as Samsung presumably did with Google and Cisco? What seems reasonable to you in light of their leverage in litigation and their contributions to innovation? Feel free to send your thoughts with or without your rationale. This blog covered almost every decision worldwide in this dispute. I can't guarantee that I never missed anything, and I didn't do a separate blog post on the fact that Apple fended off a Samsung lawsuit in Japan over a standard-essential patent. You don't have to take my word for it and can easily find other reports on the decisions I covered. The parties' royalty demands are unknown, and let's not assume that someone's damages claims are the same as their royalty demands in a settlement negotiation. Based on the public record, Samsung appears to be demanding from Apple, for its wireless SEPs, 2.4% of the price of its 3G-compatible products (for example, $12 for a $500 device), but it also proposed a cheaper or possibly even royalty-free cross-license if Apple made its own non-SEPs available. In 2010, the year before the dispute began, Apple proposed a $30 per-unit royalty with various options for Samsung to obtain discounts. It's hard to find out what companies pay for patent licenses. There were some indications in 2011 that Apple paid hundreds of millions of dollars to Nokia (possibly even on an annual basis). Apple once told a U.S. court that if it determined that Apple should pay Google's Motorola Mobility $1 per phone for its wireless SEPs, it would accept this determination (but not one cent more). There were rumors of HTC paying between $6 and $8 per phone to Apple, but HTC's CEO called these estimates "baseless and very, very wrong" and even "outrageous". Ericsson recently announced a $650 million royalty payment from Samsung in a given quarter (right after a settlement), suggesting that over the years Samsung pays billions of dollars to Ericsson. Microsoft is rumored to generate Android patent royalties of $2 billion per year, and Samsung is one of its 23 licensees (almost every major Android device maker is paying Microsoft royalties, with Motorola Mobility and Huawei, and possibly Amazon, being the most notable exceptions). Apple deserves credit for revolutionizing the whole smartphone space and singlehandedly creating a mass market for tablets. And Apple is obviously (as its court filings have repeatedly indicated) unhappy about the fact that Samsung is now the global smartphone market leader. However, in a recent decision to deny Apple (once again) a permanent injunction, Judge Lucy Koh (who will preside over the trial starting on Monday) said that "Apple, in other words, cannot obtain a permanent injunction merely because Samsung's lawful competition impacts Apple in a way that monetary damages cannot remedy". A key non-monetary term to consider is that Apple says it has consistently insisted, and continues to insist, on an anti-cloning provision (disputing representations or suggestions to the contrary by Samsung). Apple and Samsung could agree on different royalties in different markets, e.g. X amount in the U.S., Y amount in Europe, and Z amount in the rest of the world. But most of the time companies agree on a worldwide royalty rate that reflects the relevance of different markets and the leverage they gain from their patents in those markets. For the purposes of this discussion here, let's keep things simple and assume a worldwide rate. But let's consider that the U.S. market represents a decreasing percentage of the global market (here's a great Guardian article on the global marketplace, entitled "Smartphone explosion in 2014 will see ownership in India pass US"). In some of the largest markets, IP enforcement is difficult, and in Europe, where IP is reasonably strong, these parties have won practically nothing against each other, at least nothing commercial meaningful, despite patent assertions in multiple European countries (case in point, an invention that will go to trial next week was not deemed patentworthy by 10 European judges in three countries). In some large, fast-growing market like the BRIC countries (Brazil, Russia, India, China), they haven't even tried enforcing their patents against each other. So, all things considered, if you were a mediator making a proposal to the parties for a settlement that you think is reasonably acceptable to both, what would you say? Please let me know. This week I'm spending my time mostly on software development, but today is an exception and I wanted to share some information of the kind I usually don't blog about. In connection with the Apple v. Samsung dispute in the U.S., Reuters, MLex and others (such as the First Amendment Coalition, whose members include the Associated Press, the Los Angeles Times, and Wired) filed formal petitions to grant the general public access to certain sealed court documents (relating to damages estimates, for example). At the time I thanked them for this effort on Twitter. Their fight for the important cause of transparency inspired and encouraged me not to back down when I encountered some resistance to various requests for access to the case files of nullity (patent invalidation) actions pending before the Federal Patent Court of Germany. There is no such thing as PACER in my country. The only way to find out about the details of patent infringement cases is to attend the hearings and the announcements of the decisions in person (which I do all the time, though I don't blog about it if I do so for clients who wish to receive exclusive, private reports). Nullity (invalidation) cases are separate proceedings (this is called "bifurcation", and I criticized it in my previous post), and at least there is some degree of transparency there -- no PACER-like electronic access, but at least any member of the general public can file a petition and, if the petition succeeds, take a look at the original case file in what they call the "public search room" (that's the official English translation) of the German Patent and Trademark Office (which, like the Federal Patent Court, is based in Munich). Once a petition is filed, the parties to a nullity action are asked to designate documents as confidential. If the petitioner narrows the request accordingly, which is what I usually do, then there is no dispute and all other documents are made available in the "public search room". Otherwise the court has to decide whether to grant the sealing requests. In the cases in which I petitioned, I didn't run into any disagreement with Apple, Microsoft, and Motorola Mobility. And for the most part I had no problem with Samsung either, but in a couple of cases its lead patent attorney in the Apple cases, Zimmermann & Partner's Dr. Joel Naegerl ("Nägerl" in German), was too protective of his client's interests in confidentiality for my taste. Dr. Naegerl has done a great job for Samsung on the defensive side and deserves most of the credit for getting Apple's slide-to-unlock patent invalidated about a year ago (a member of the same patent family will go to trial in California on Monday, but fortunately for Apple, neither Dr. Naegerl nor any of the judges of the Federal Patent Court will be on the San Jose jury). I just couldn't accept some of his sealing requests. Among other things Dr. Naegerl opposed my access to a preliminary ruling on Apple's photo gallery patent (which was also invalidated). And he claimed that any document in a nullity case file that relates to a parallel infringement case is confidential just because the courts hearing the infringement cases don't grant the general public access to documents. Some of the documents filed in infringement cases undoubtedly contain confidential business information, but some don't. I just wanted to ensure that someone who puts in a sealing request (regardless of whether we're talking about Samsung or anyone else) at least has to state a reason that is specific to the content of a document. Today I went to the "public search room" and read the sur-reply. The document revealed nothing confidential (such as licensing terms, licensing negotiations, inner workings of products etc.). I depend on access to documents for my patent litigation-related work, and a reasonable degree of transparency is also in the public interest. Just like I had a "free-rider" benefit from the effort that others made in California, I hope that others will benefit from my work here in Germany, a hotbed for patent litigation between global players. Next week's California trial will be public proceeding. I won't be able to attend it, but I will follow it to the extent that I can over the Internet, particularly Twitter. Maybe I'll do a pretrial post on Monday, but it's also possible that I'll focus on the Supreme Court hearing in CLS Bank v. Alice on Monday (some stakeholders try to turn this into a general debate over whether computer-implemented inventions should be patent-eligible, an issue I'm very interested in for a variety of reasons, including that I'm soon going to file my first patent application) and blog about Apple v. Samsung only after the first couple of days (after both parties' opening arguments etc.). Ericsson is increasingly becoming a patent troll (and privateer feeder) in the sense that it places the emphasis on patent monetization and apparently expects more growth in that business area than in its product business. The more I learn about its related activities, the less I like its practices. What I do like, however, is that its conduct brings to light certain issues that are relevant and, unfortunately, not limited to Ericsson. Transparency, whether intended (when Ericsson explained why it collects royalties from device makers rather than chipset manufactures, i.e in order to charge more) or unintended (when bad behavior comes to light as a result of the two ongoing antitrust investigations in India or court proceedings), is always appreciated. If the dispute between Ericsson and Samsung had not been settled before any ruling came down, we would likely have learned a lot. Both companies accused each of other of suddenly asking for far higher royalties than in the past. The details of this will remain sealed forever. But I have now obtained what I consider a smoking gun that lends credence to Samsung's allegations concerning Ericsson: a November 7, 2013 order by the High Court of Delhi at New Delhi, India, in a case in which a company named Saral Communications was fighting customs seizures of shipments that had apparently been requested by Ericsson on the basis of it wireless standard-essential patents (SEPs). This is the first time I do a post on a book, and it won't happen again in a long time. I strongly discourage publishers and authors from contacting me about book reviews (it happens all the time, actually) unless my work is mentioned in the book in question. There's a chapter on the summer 2012 Apple v. Samsung jury trial (this one I have indeed read), and it also mentions my work and how I experienced the billion-dollar verdict across considerable geographic distance. The official release date is this coming Tuesday (March 18). You can find several links that lead you to online retailers on the author's official page for the book. These are definitely interesting times at Apple. The next California trial against Samsung will kick off in two weeks from tomorrow (March 31), and it's actually an Apple v. Google trial (Google technologies are at issue and plenty of Google witnesses will appear) styled as an Apple v. Samsung trial. I'll talk about this more before the trial starts. Basically, what Apple is doing is to portray as an America v. Asia issue what is, at its technical heart, a Silicon Valley v. Silicon Valley, or Cupertino v. Mountain View, in-fight. The distance between the true rivals' headquarters is a 12-minute drive, not a 12-hour flight. Apple can obviously choose whom in the Android value chain it targets with its lawsuits, but it will have to be somewhat careful about the America v. Asia theme this time around because Judge Koh strongly criticized its appeal to jurors' national bias at the November 2013 retrial in the first case. Earlier this week I wrote about Apple's $40-per-unit damages claim. It has received more "Google +1" clicks than any other of my posts. I have seen many other critical comments on the amount and wish to highlight this commentary by Yankee Group Senior Analyst Boris Metodiev. Mr. Metodiev says Apple's claim is "nothing short of extraordinary" and "looks ridiculous", and he has "no idea how it came up with that number". It would obviously have been much harder for Apple to present such a high per-unit claim if it had elected to sue Google rather than Samsung. Even Samsung's average per-device sales prices don't justify Apple's damages claim, but Google's revenue per Android copy distributed is much lower. Of course, there are damages theories that could be used against Google, but it's certainly more difficult, at least psychologically, to demand a high per-unit damages number from Google for five out of allegedly 250,000 patented inventions that are implemented in a smartphone. Even this lawsuit won't be able to change anything about the fact that the "Haunted Empire" has strategically lost the platform battle. It now has to focus on defending the second place against, for example, Windows, which has even forged ahead of iOS in some markets. A recent Developer Economics report by VisionMobile says that "[t]he Mobile Developer Mindshare Q3 2013 shows Android leading at 71% of developers using the platform, followed by iOS at 56%", and the revenue gap is closing. A couple of years ago many developers had an iOS-first-Android-later approach. By now, more and more developers, especially those who focus on the global market and not just the U.S., do it the other way round. These were just some personal Sunday morning reflections. 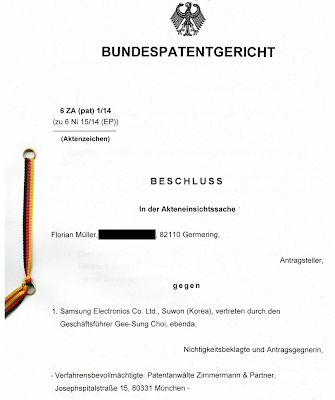 If you're bored enough on this Sunday to want to waste your time on something that is absolutely unrelated to IP but quite a coincidence, let me mention that I'm being (indirectly) sued by an Apple employee in my neighborhood (a biz dev guy working for Apple's German subsidiary in Munich). I was informally notified of his January 2014 complaint only on Wednesday, the day after I criticized Apple's $40 damages claim. It's a funny coincidence that after years of covering Apple's lawsuits and after more than 15 years without being sued by anyone over anything, I should now have to defend myself, in the role of an intervenor, against a lawsuit brought by an Apple guy. The percentage of Apple employees in this area is a lot lower than in Silicon Valley. But one employee of the "Haunted Empire" is apparently all it takes to be haunted by a lawsuit. Fortunately, we have a "loser pays" rule here. It also benefits intervenors like me (the formal defendant is the Apple guy's landlady) and ensures trolls get the bill in the end. Then, we unfortunately don't have an equivalent to a motion to dismiss (or summary judgment) that would take care of a frivolous complaint early on. That meritless lawsuit is based on the allegation that he and his family believe I could use my cameras, which clearly capture only a gate that I can't see from my house (I have a private road that is 50 meters long and there are some trees and hedges in between), and the door intercom system, which is four meters away from a hedge behind which the Apple guy has its garden, to spy on them and their conversations. Those who know the technology involved know it simply isn't possible; those who personally know me also know I wouldn't even try this (apart from the fact that I wouldn't have time for it; I monitor some Apple lawsuits, not its employees). I had the cameras installed in 2012 (the number of burglaries has been on the rise here lately, about 10% per year) and before they were even installed, he had already thought that the motion detectors (that just make the light go on when it's dark) were cameras. He never communicated with me, only with his landlady who then contacted me, and I explained, through this channel, that motion detectors and cameras are different things. One can actually find pictures on the Internet that show those are just motion detectors. After this clarification, however, the problem surprisingly didn't go away. I was told that he still had a concern: one could hide a camera inside a motion detector, he said. The lawsuit is now about the real cameras and the door intercom system, but it has no more merit than the camera-hidden-in-motion-detector paranoia, which shows what kind of litigant I'm dealing with. Compared to that, I'll take the $40 per device thing any day of the week. I know some other Apple people and the ones who talk to me directly (whether or not they have a problem) are not like him. Just wanted to clarify that ;-) But in such a large organization, I guess someone will always be haunted by something. There hasn't been much progress so far with the Rockstar Consortium's Halloween lawsuits against Google and seven Android device makers (one of whom, Huawei, has already settled) because the parties are still debating the proper venue. But the venue fight does involve some substantive issues, and as a side effect of the related motion practice it became known that Nortel employees told Google back in 2010 that it infringed certain patents that Rockstar is asserting now. Late last year Rockstar already added Google as a co-defendant to its Samsung lawsuit. That was the first amended complaint in Rockstar v. Samsung. Rockstar is now seeking permission to file a second amended complaint. In the first one, it asserted only three of the seven patents-in-suit against Google. The objective of the proposed second amended complaint (i.e., the third version in total) is to additionally asserted the four other patents against Google as well. Since those four patents were previously already asserted against Samsung and were addressed by Google in its declaratory judgment action in the Northern District of California, Rockstar argues there's no reasonable basis for Google to oppose this addition. But there is a disagreement. Samsung was first to bring a motion to dismiss Rockstar's lawsuit(s) for lack of standing at the time of filing and, with respect to one of the patents-in-suit, on the grounds of invalidity. The other Android OEMs brought similar, though not in all cases identical, motions to dismiss shortly thereafter. ZTE was last to do so (mentioned in this post) and additionally argued that Rockstar lacked a basis to allege willful infringement of the '551 patent. Rockstar amended its complaint against ZTE accordingly, rendering the '551 willfulness issue moot. I guess Rockstar's procedural steps will be sufficient to dissuade Judge Gilstrap in Texas from granting any motion to transfer, but won't dissuade Google and its OEMs from filing a somewhat likely mandamus petition with the Federal Circuit. Google could lose in Texas or win in California; so could Rockstar. But especially with a view to pretrial decisions (summary judgment etc. ), the Northern District of California would clearly be a better venue for the defendants in these cases. Finally, on a somewhat related note I'd like to mention something here on which I already commented on Twitter. Bloomberg reported on Google's successful efforts to find out who is behind a patent troll named Suffolk Technologies LLC that is suing it over a former BT patent, and it turned out that "Suffolk is owned by Corporate Research Partners, which is owned by IPValue, formed in 2001 by a joint venture of Goldman Sachs, General Atlantic Partners and Boston Consulting Group". A spokeswoman for Goldman Sachs "said the company has a minority, non-controlling stake in iFormation Group, the parent of IPValue", reports Bloomberg. This doesn't reflect favorably on Goldman Sachs at all, and Google did the world a service by naming and shaming Goldman Sachs for its involvement with patent trolling. But the Bloomberg article misses an important point: while Google supports disclosures of the real party in interest in connection with litigation, it has said that it's not really interested in ensuring transparency in patent ownership before litigation is brought. And that's where transparency should begin. So, while I congratulate Google on its revelations regarding Goldman Sachs, I would encourage it to promote transparency in patent ownership at all levels and all stages, not just selectively. I have only this week become aware of a development that is relevant to a subject often discussed on this blog: the availability and enforcement of injunctions over FRAND-pledged standard-essential patents (SEPs) in Germany. About a year ago, the Dusseldorf Regional Court referred various related questions to the Court of Justice of the EU in a Huawei v. ZTE case and stayed its proceedings despite identifying an infringement. As a result, those seeking to enforce SEPs in Germany were concerned that other cases of that kind would also be stayed, while those having to defend themselves frequently invoked the pending CJEU case. It now turns out that, subject to the specifics of a case, injunctive relief over SEPs is still available if you prevail on liability before the Mannheim Regional Court (at least its Second Civil Chamber, which Judge Dr. Kircher presides over) and either face no Orange-Book-Standard defense or manage to overcome it. In November, another panel of the Mannheim court -- the Seventh Civil Chamber, which Judge Voss ("Voß" in German) presides over -- had stayed a Motorola v. Apple FRAND rate-setting case and referred questions so the European Commission. But the circumstances in that case are different. It's not an infringement/injunction matter, and there is an ongoing European Commission investigation of Motorola Mobility's use of SEPs against Apple (and one concerning its SEP assertions against Microsoft) in Europe. There is no ongoing investigation of Vringo's assertions, however. The Mannheim injunction and the Karlsruhe denial of a motion for stay are notable successes for Vringo's lead counsel in the German litigations against ZTE, Klaus Haft of Reimann Osterrieth Koehler Haft. While I'm personally against injunctions over SEPs, I do recognize that this outcome is no small achievement, under the circumstances, for Vringo and its counsel. Mr. Haft has litigated FRAND matters on multiple occasions. For one example, he represented Nokia in its SEP cases against ViewSonic, and ViewSonic settled the SEP part of its dispute with Nokia last year by taking a royalty-bearing license (the non-SEP part is still ongoing). I have also seen Mr. Haft defend clients vigorously against SEP assertions. His firm also represented Deutsche Telekom against patent licensing firm IPCom (a dispute that was settled in June 2013). Vringo's headway against ZTE will probably encourage other litigants to continue to seek SEP-based injunctions in Germany, particularly in Mannheim. Any case that would be filed now would realistically be adjudged only after the CJEU has handed down an opinion in Huawei v. ZTE, a decision that may or may not provide clarity concerning SEP-based injunctions in the European Union. Last week, Samsung appealed the final judgment in its first California litigation with Apple on the same day on which it was handed down, and about a month after Judge Koh had denied both parties' motions for judgment as a matter of law (JMOL) (at which point the clock for an appeal arguably began to tick for Samsung). It was very likely that Apple would appeal the unfavorable parts of the judgment, particularly last week's (second) denial of a permanent injunction. And late on Tuesday, Apple indeed filed a notice of its cross-appeal. Apple's appeal relates to the final judgment as well as "all interlocutory decisions and orders subsidiary thereto or subsumed therein, including but not limited to, the August 24, 2012 Judgment (Dkt. No. 1933), the March 1, 2013 Order re: Damages (Dkt. No. 2271), and the November 21, 2013 Judgment (Dkt. No. 2823), as well as the March 6, 2014 Order Denying Apple's Renewed Motion for Permanent Injunction (Dkt. No. 3015), to the United States Court of Appeals for the Federal Circuit". "Even though Samsung's lawyers present some of their arguments in a pretty compelling fashion (for example, the fact that the "Hauser" survey, the key piece of evidence here that shows consumers' willingness to pay premium prices for certain patented features, doesn't compare particular features to the best non-infringing alternative), entry of a permanent injunction is still the most likely outcome here. The Federal Circuit didn't want to give a direct instruction to Judge Koh that she enter an injunction on remand. Instead, it basically said that Judge Koh stopped the analysis too early, and deferred to the court of equity. But Judge Koh will look at the forest, not only the trees Samsung addresses. And the overall picture is that the Federal Circuit most likely would have rejected Apple's appeal if it had felt that, all things considered, Apple should once again be denied a permanent injunction." I acknowledge that Samsung and its lawyers were right on this one. What looked like a long shot worked out for them. But I also wouldn't be surprised if Apple gave it another try, hoping that the appeals court will then provide clarification that results in an injunction. Apple's reference to the March 1 damages order means that it reserves the right to defend, on appeal, the original (August 2012) jury verdict. After all, juries get a lot of deference, and maybe Apple hopes that the appeals court will reject the reverse engineering of the verdict by Samsung's lawyers. But where it is very clear how a jury arrived at its numbers, reverse engineering is acceptable. With respect to one product, the Galaxy Prevail, the jury verdict is absolutely indefensible (provided that reverse engineering is performed) because the jury awarded a wrong category of damages. So the Apple v. Samsung cross-appeal has started, and I'll follow it very closely. With respect to another high-profile cross-appeal involving Apple, I'm wondering when the Federal Circuit will finally hand down its opinion. The appellate hearing in the "Posner" Apple v. Motorola litigation was held six months and one day ago, on September 11. That's an incredibly long time between a hearing and an appellate decision. Admittedly, it's a huge case with offensive claims brought by both parties, and the Federal Circuit has never been busier. Still, this is now taking unusually long. In late January I already thought that the ruling was likely to issue any moment. At the hearing it appeared that Apple was on the winning track. A remand of Apple's offensive case, involving among other things the "Steve Jobs patent", looked like a given. Before that trial finally happens, Motorola's handset business will belong to Lenovo. A remand of Motorola's standard-essential patent claims is also a possibility, but Chief Judge Rader called Motorola's SEP damages claim "crazy" (twice, in fact). I would like to see the Federal Circuit affirm Judge Posner's denial of injunctive relief over SEPs, but it's not certain that it will reach that issue. Judge Posner dismissed the Apple-Motorola case before him, instead of holding a trial that had already been scheduled, because he concluded that the parties weren't entitled to any remedy whatsoever. Technically, if the Federal Circuit held that Motorola was entitled to some damages (though nowhere near the amount it sought), that could be enough to remand for further proceedings, but both parties definitely wanted -- and many other industry players also want -- clarity on the question of SEP-based injunctions. That issue might very well be appealed to the Supreme Court, and in my opinion it would be "certworthy". I have sometimes, maybe even quite often, but not always agreed with Apple. And I have disagreed with Apple on more occasions than parts of the Android and open source communities have acknowledged. Now that I have obtained the public transcript (which you can find at the end of this post) of a January 23 hearing held by the United States District Court for the Northern District of California on Apple and Samsung's motions to toss each other's damages theories, I face the first situation in which I don't merely disagree with Apple but am rather wondering whether it has lost its mind. Apple's damages theory for the trial that will begin in less than three weeks (on March 31) is an objective insanity, and I say so even though Judge Koh allowed Apple to present it to the jury. A damages expert will argue on Apple's behalf that, if the parties had acted reasonably and rationally in a hypothetical negotiation, Samsung would have agreed to pay $40 -- forty dollars! -- per phone or tablet sold as a total royalty for the five patents-in-suit, which relate to (but don't even fully monopolize) the phone number tapping feature, unified search, data synchronization, slide-to-unlock, and autocomplete. The theory is that Samsung would simply have raised its prices accordingly. (You can find the final list of Apple's patents-in-suit here; that post also lists Samsung's patents-in-suit, but three more patent claims have since been dropped). $40 per unit. For five software patents. Give me a break. Reality distortion would be a total understatement for this. On average, that is $8 per patent per unit. About two years ago, after someone was awarded that per-patent-per-unit figure against Research In Motion (now BlackBerry), I said that such damages/royalty figures would make smartphone unaffordable and performed a simple calculation: "[E]ven if I take only half of the Google/RPX estimate (i.e., 125,000 [patents used in a modern-day smartphone]), the potential licensing cost per smartphone would amount to $1,000,000 -- yes, one million dollars per device -- if the average licensing cost per patent corresponded to this [rate]", which I called "absolutely unsustainable". And I presented a much more conservative calculation: "Even if I wanted to give [the plaintiff in that case] the benefit of the doubt that this patent is 100 times (!) as valuable as the average patent, and if I assumed that the Google/RPX estimate is 10 times the accurate number of patents, the per-device license fee would still be $2,000." At a meeting between Apple and Samsung in 2010 (the year before this litigation started), Apple proposed a royalty of $30 per unit for an entire portfolio, not just a handful of patents (to be precise, the proposal also involved a rate of $40 per unit for tablet computers, but only for the first two years). In the first California litigation, Apple's reasonable royalty damages claim for its software patents was only a fraction of what it wants now. The per-unit royalty claims in the summer 2012 trial were $3.10 for the "pinch-to-zoom API" '915 patent (which the USPTO now considers invalid) and $2.02 each for the "overscroll bounce" (or "rubber-banding") '318 patent and the "tap-to-zoom-and-navigate" '163 patent. That was a total of §7.14 for three software patents. The total damages amount in the first case ($929 million after two trials, but prior to the appeal, which Samsung filed last week) was $929 million, but the bulk of that was related to design patents and trade dress, i.e., intellectual property rights for which U.S. statutory law explicitly allows damages theories (disgorgement of infringer's profits) that are legally unavailable for utility (i.e., technical) patents. I have repeatedly criticized, and won't ever support, Samsung's 2.4%-of-total-device-sales royalty demand for its portfolio of wireless standard-essential patents (SEPs). Apple has argued over and over, and rightly in my opinion, that the number is not a FRAND royalty rate. Apple and I have also taken that position on Motorola Mobility's 2.25% demand for a portfolio of patents of the same kind. But 2.25% or 2.4% of the price of a $500 iPhone would be $12 per unit -- less than a third of what Apple wants for five software patents, and Samsung and Motorola hold a far greater number of wireless SEPs. I still believe that SEP and non-SEP issues must not be mixed up in connection with injunctive relief. But when it comes to the FR part of FRAND ("fair and reasonable"), the question of double standards is legitimate (of course, provided that one takes into consideration any relevant differences between the patents or portfolios compared, but few people would probably think that patents relating to things like autocomplete are inherently more valuable than wireless SEPs). If patents are not encumbered by a FRAND licensing pledge, a patentee can ask for anything, but here we have a situation where Apple's damages expert argues that Samsung would actually have paid the amount at the end of a hypothetical, perfectly rational negotiation. And that theory undermines Apple's FRAND arguments big time, at least psychologically, because Samsung and Motorola would also argue that Apple would have paid them $12 per phone at the end of a reasonably-led negotiation. Antitrust authorities have probably been aware of Apple's non-SEP royalty theories for a while. I still hope regulators will give meaning to FRAND, but it's only human if some decision-makers note a major discrepancy between Apple's positions on reasonable royalties and if this makes them less inclined to impose drastic sanctions on Apple's rivals. I can understand that Apple, almost three years after having filed its first lawsuit against Samsung, is disappointed with the fact that it has no enforceable remedies in place in the United States. But seeking out-of-this-world damages based on bizarre theories of what a hypothetical negotiation would result in is not the answer. MR. WATSON: GOOD AFTERNOON, YOUR HONOR. SCOTT WATSON TO ADDRESS THE CHEVALIER MOTION. ACTUALLY, YOUR HONOR, THE INTERESTING THING HERE IS THAT THE CONSIDERATION OF THE LICENSING DATA IN THIS CASE ACTUALLY PUSHES DR. CHEVALIER'S RATE UP, NOT DOWN. AND IF YOU LOOK AT FOOTNOTE 1 IN APPLE'S BRIEF, THIS HAS GOT TO BE A FIRST IN THE HISTORY OF DAUBERT. APPLE SAYS, "WE'D LIKE TO EXCLUDE THIS EVIDENCE. WE DON'T TAKE ISSUE WITH THE RESULTS OF HER ANALYSIS." THEY'RE NOT ASKING TO EXCLUDE THE REASONABLE ROYALTY NUMBERS THAT DR. CHEVALIER ENDED UP WITH, THEY JUST WANT TO EXCLUDE THE ACTUAL LICENSING DATA IN THE CASE. AND, YOUR HONOR, THE REASON FOR THAT IS BECAUSE IT IS OUT OF ALL BOUNDS FROM THE DAMAGES NUMBERS THAT APPLE WOULD LIKE TO PUT UP. EACH -- EACH OF THESE DIFFERENT TYPES OF LICENSING EVIDENCE DIRECTLY IMPEACH THE NUMBER APPLE WANTS TO PUT UP. MR. WATSON: WELL, YOUR HONOR, IF I MAY, SHE IS A PROFESSOR WHO TEACHES IN THE TECHNOLOGY SPACE AT THE YALE BUSINESS SCHOOL. SHE IS THE PERSON WHO CHAIRED YALE'S COMMITTEE ON COOPERATIVE RESEARCH, WHICH IS THE LICENSING ARM OF YALE. SO SHE WAS THE CHAIR FOR LICENSING ALL OF YALE'S INTELLECTUAL PROPERTY FOR THREE YEARS. THIS IS A WOMAN WHO HAS READ LICENSE AGREEMENTS, WHO IS FAMILIAR WITH THE TECHNOLOGY. AND, YOUR HONOR, THEY HAVEN'T PUT A SINGLE LICENSE IN FRONT OF YOU IN THEIR PAPERS AND SAID, "LOOK AT THIS LICENSE, THIS ISN'T COMPARABLE. LOOK AT THIS TYPE OF TECHNOLOGY, IT'S NOT COMPARABLE." IF YOU LOOK AT THE BODY OF HER REPORT AT PARAGRAPH 327, SHE'S IDENTIFYING THE TYPES OF PATENTS WE HAVE IN THIS CASE. THESE ARE SMALL FEATURES ON A VERY COMPLEX PRODUCT. AND IF YOU LOOK AT THE DISCUSSION IN PARAGRAPH 327 OF HER REPORT, SHE HAS ILLUSTRATIVE EXAMPLES. NOW, YOUR HONOR SAID, WELL, SHE'S EXCLUDED SOME OF THE LARGER LICENSES. THOSE ARE PORTFOLIO CROSS-LICENSES. APPLE DOESN'T DISPUTE THAT THOSE SHOULD BE EXCLUDED. MR. WATSON: WELL, YOUR HONOR, I MEAN, THEY'RE -- SHE OBVIOUSLY HAS A LOT OF DATA POINTS THAT ARE GOING INTO A VERY SOPHISTICATED, I SUBMIT, GEORGIA PACIFIC ANALYSIS AND IT'S IN THE RECORD AND THE COURT CAN LOOK AT IT. BUT ALL I'M SAYING IS THIS IS A CASE -- IF YOU LOOK AT RESQNET AND YOU LOOK AT THE OTHER FEDERAL CIRCUIT CASES, WHAT ARE THEY CONCERNED ABOUT? THEY'RE CONCERNED ABOUT CHERRY PICKING LICENSES IN YOUR FAVOR. YOU'RE GOING TO LOOK AT THE BENQ LICENSE AND NOT AT THE OTHER 29 BECAUSE IT'S SIX TIMES BIGGER AND YOU'RE TRYING TO SKEW THE NUMBERS. THAT'S NOT WHAT'S GOING ON HERE. DR. CHEVALIER IS MOVING HER NUMBER UP BECAUSE OF THE LICENSING DATA. THE ONLY REASON APPLE IS BRINGING THIS MOTION IS BECAUSE THE LICENSING DATA IS COMPLETELY INCONSISTENT WITH THE IDEA THAT ANYONE WOULD PAY $40 FOR FIVE SMARTPHONE PATENTS PER UNIT. MR. QUINN: IF WE COULD LOOK AT THAT EDGEWORTH BOX SLIDE. THIS IS THE REASONABLE NEGOTIATION ANALYSIS THAT DR. VELLTURO DOES. HE CONCLUDED THAT SAMSUNG'S WILLINGNESS TO PAY IS ON THE RIGHT-HAND SIDE. APPLE'S WILLINGNESS TO ACCEPT FOR ALL OF THESE PATENTS, WHICH ADDS UP TO $40, $40 PER UNIT IS THE LOST PROFITS NUMBER WHICH HE TIES BACK TO HAUSER, AND HE CONCLUDED THAT THE RESULT OF A REASONABLE NEGOTIATION WOULD BE THAT SAMSUNG WOULD SIMPLY RAISE PRICES AND PAY EVERYTHING THAT APPLE IS WILLING TO ACCEPT.